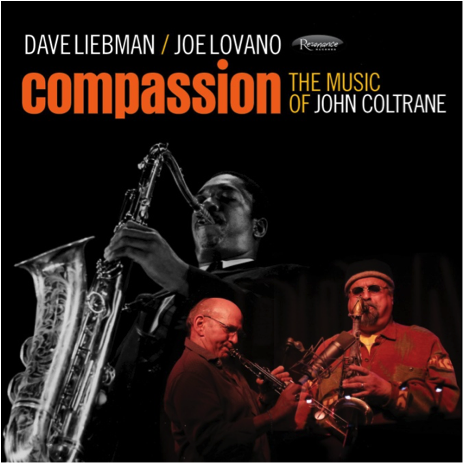 In 2007 BBC Radio commissioned saxophonist Dave Liebmanto record an all-Coltrane program to mark the 40th anniversary of legendary saxophonist/composer John Coltrane‘s passing. Asked to bring in Saxophone Summit—the band Liebman co-led with fellow saxophonists Joe Lovano and Ravi Coltrane—Liebman managed to assemble regular members Lovano, pianist Phil Markowitz, and drummer Billy Hart, along with bassist Ron McClure as a substitute for the unavailable Cecil McBee. Ten years later, the session is being released to commemorate the 50th anniversary of Coltrane’s passing on July 17, 1967. Billy Hart says that “we’re all just unbelievable Coltrane fans.” If the playing alone wasn’t enough to show that, there’s also the evidence of Liebman’s album Homage To John Coltrane (Owl Records), going back to 1987. This set opens with “Locomotion,” a distinctive take on the blues from Blue Train (Blue Note, 1958). The tune contains the germs of many later Coltrane works, and makes a great launching point, the classic two tenor lineup dueling with each other and egging each other on. A ballad medley showcases the two horns individually—Lovano on tenor for “Central Park West” from Coltrane’s Sound (Atlantic, 1964; but recorded in 1960); Liebman on soprano for “Dear Lord” from Transition (Impulse!, 1970, but recorded in 1965). This spiritual ballad has long had a special place for Liebman, and is the only composition repeated from his early tribute album. “Olé” from Olé Coltrane (Atlantic, 1961) represents Coltrane’s long term interest in world music, which later came out in tunes like “India” and “Brazilia.” After an introduction featuring wood flute and flute, the Spanish-tinged melody is introduced by tenor and soprano saxophones. “Reverend King” from Cosmic Music (Impulse!, 1968, but recorded in 1966) features Liebman on flute, accompanied by Lovano’s alto clarinet: a lovely combination unique to this track. “Equinox” (also from Coltrane’s Sound) is another blues, returning to the tenor/soprano combination. The album closes with “Compassion” from Meditations (Impulse!, 1966), dipping into Trane’s late period. It gives Hart a solo showcase before launching into the free group improvisation with little steady pulse or set harmonic progressions that typifies late Coltrane. The band is so comfortable with this approach that they play it much like the earlier material: a bit more outside, but there is no sharp dividing line. John Coltrane’s career was so compressed that the compositions here—recorded between 1958 and 1966—represent six distinct stylistic phases. The more-or-less chronological presentation demonstrates how far he progressed in such a brief period, as well as how he maintained his own voice all the way. Coltrane’s music needs no defense, but these players make an excellent case for it all the same.